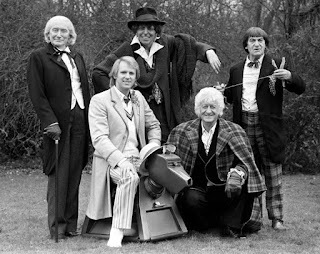 Dr Who The Five Doctors. Photography. Britannica ImageQuest, Encyclopædia Britannica, 25 May 2016.
quest.eb.com/search/158_2476120/1/158_2476120/cite. Accessed 27 Oct 2017. On November 23, 1963, Doctor Who debuted on the BBC. And so began the televisual adventure that has kept fans enraptured for over fifty years, through twelve different regenerations of the Doctor. The 13th and first female incarnation, Jodie Whittaker, will take her place in the TARDIS for the upcoming 2017 Christmas Special (some people are disappointed that the Doctor is a woman, and some people are sad that the Doctor is still not ginger - redhead, as we would say stateside). Since that fateful November day, it has delighted Doctor Who authors and showrunners to make homages in the Whoniverse to that date - characters have been born (most notably Clara Oswald) and died, the Doctor or his companions have had to return to that date to complete a mission, and in 2013 it was the date the special 50th anniversary episode, The Day of the Doctor, was broadcast simultaneously in 94 countries. Who's your favorite Doctor? Let us know in the comments! Don't forget to check out our Whoniverse LibGuide, your source for Doctor Who in our library catalog!